More photos from the event are found here. We opened our weekend with an informal gathering at the Astronomical Research Institute (ARI) http://ari.home.mchsi.com/index.htm. Bob and Jackie Holmes welcomed us into their home and observatory, complete with eclipsing binary star cookies, along with other treats. Huge thanks to the Holmes! 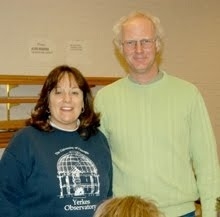 Bob, Viv, Pam and hubby, Kevin and Peggy participated in the imaging of asteroids and galaxies. It was rather awesome to sit at the controls and make decisions as to "good" or "bad" images on the fly, and compile a series of images. We then used Astrometrica software to stack images which were then used for the Tokyo "Live Shows” at 11 p.m. and midnight. During the "Live Show,” we visited with patrons of the Tokyo Science Museum via video messaging. It was amazing to see an image we had just captured at ARI flashed on a screen on the other side of the planet. We ended the evening with a quick trip out to see the telescopes and be amazed. Many thanks to Jim Conwell and the Eastern Illinois University Physics Department, for hosting us for Saturday's workshop. We met in the Physical Science Building (just behind the castle!). 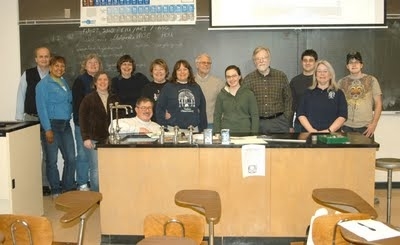 All the folks from Friday along with Margie, Ruth, Sue, Kathleen R, Gary S, and Richard R as well as three undergrad Physics/Astronomy students joined for the day. Visit EIU here. The teachers and EIU students who attended the WISE astrometric and photometric workshop. The majority of the group in attendance today had already attended one or two previous HOU/WISE workshops focusing on searching for asteroids using Astrometrica. Several of us, (Viv, Kathleen, Kevin and Peggy) had also joined in an asteroid search with students and so had some practical experience. These beginning asteroid hunters are given a set of three stacks of images which are then searched. Today’s focus brought us to the next level, using the stacking process (stack and track) and changing the background and range (stretching) to enhance the eyes ability to detect asteroid movement. Viv and Bob started us off with a demonstration using Astrometrica to observe asteroids. Starting from a large number of individual images, stacks were created. These stacks can be created based on stationary stars to produce an elongated asteroid. This process produces bright well rounded stars and dim elongated asteroids. When these stacks are blinked, it is difficult to detect the dim asteroid moving across the star field. If you knowing the apparent speed and direction of the asteroid, the stack can be produced based on a stationary asteroid. In this case, the stack image shows dimmer, elongated stars and brighter, well rounded asteroids. When these stacks are blinked, the small, bright asteroid moves across a field of elongated stars. The stars are elongated in the direction of the asteroid motion, and their length represents the distance that the asteroid will have moved from one stack to the next. We found it much easier to hunt asteroids using this method! The majority of the afternoon was spent practicing stacking techniques and hunting for asteroids using a variety of image sets. Typical ARCS interactions took place with lots of learning and lots of laughs. Ruth started to conceptualize a problem based learning scenario to use to engage students in the hunt for killer asteroids. We helped better define the orbits of many asteroids out there, you can sleep easy tonight! Throughout the day we took mini brain breaks to discuss/share a variety of topics such as, online communications, use of color gels/filters, use of solar cells with squealer and just about anything else, asteroid models, etc. The evening was spent socializing, touring the observatory and indulging in Jackie's delicious creations. Peggy demonstrated how she could find that asteroid again just like t.................................h.................................a...........................t! Weekend Mar 26-28 - Live Show, new teachers from Lou, build rocket launchers (Walter?) and Radio Jove (Sherry? ), asteroid sharing, plan May teacher professional development. 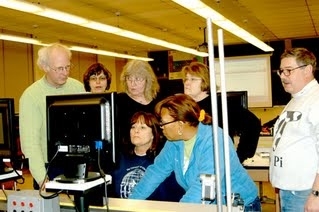 Wisconsin Teacher professional development - two weekends- May 14-16 and May 21-23 - we will help professionally develop 15 Wisconsin teachers each weekend. We need at least 3 instructors (ARCS teachers) per weekend.